Have the Four Ps of Marketing Become Blurred? Over at our LinkedIN Discussion Board, a lively discussion is taking place on Four Ps of Marketing. For those of you who are unfamiliar, the Four Ps are Product, Price, Promotion, and Place. These 4Ps were originally proposed by E. Jerome McCarthy in the 1960. Since then, it has been widely taught and referenced in marketing text books and courses. These 4Ps is one of the many frameworks in any marketer’s toolkit. Of course, like a painter really only needs five paint colors (the three primary colors + black and white) to mix any color needed to make a masterpiece, the 4Ps is only an elementary tool. Today’s complex business problem cannot always fit neatly into the 4Ps. One aspect that we discussed on the board was Packaging. Packaging is not one of the 4 primary Ps. It is often considered as part of Promotion, because the Promotion P includes everything that sells the product. This P includes commercial, public relations, price promotions, etc. This P includes packaging because the traditional role of packaging is to sell the product inside. The packaging is real estate at the point of sale to convince the shopper to pick up this particular item. This is why marketers spend countless hours on package design. What claims should go on the packaging? What pictures should go on the packaging? What endorsement should go on the packaging? Sometimes, we even go overboard in trying to use packaging to sell the product. Check out this video on Microsoft designs the iPod package. One of the best examples of using packaging to sell the product within is private labels. Today’s private label is made to imitate the branded item. They often take on the same look and feel in order to reinforce the idea that the product inside the private label bottle is comparable to that in the branded bottle. However, as mentioned above, things rarely fit neatly inside a framework. Today’s packaging is not necessary part of the Promotion P. How so? Because often, the packaging is part of the product’s intrinsic selling proposition. 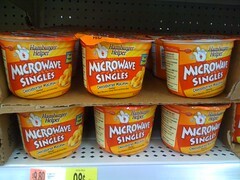 In such cases, packaging becomes part of the Product P. For example, Kraft’s microwavable single serving bowls. This is an example of functional packaging. The packaging itself is likely patented, and it serves a specific function as part of the product’s selling proposition. In this example, the bowls are designed to not melt in the microwave. This saves the consumer the step of transferring the food from the packaging to a serving utensil. This convenience is as much a part of this product as is the macaronis. To further complicate the simplicity of 4Ps, what about packaging made of recycled materials? For natural products targeted toward the natural consumers, this matters. Recycled packaging becomes part of that product’s selling proposition! What other ways can you think of that has blurred the lines of the simple 4Ps? Ahh the 5th P — might also be profit. If you cannot forecast a profit; it’s probably not worth launching the product. I know in internet marketing testing a product launch is as easy as spending 100$ in google adwords and seeing if your target audience has interest. You can even go as far as building a good landing page and a big buy it now button and use heat maps to see if the visitors click the button – it can lead to another page which says – we are currently out of stock, please enter your email address to be notified once its available again. I think the internet has blurred a lot of E. Jerome McCarthy’s “traditional marketing P’s” and I would bet that all of these nuances play a major factor today with the WWW. Plus the cost to a product is far less (online) too since many could be virtual or Saas. Can we ask E. Jerome McCarthy for an update? Yury, thanks for your comments. Indeed, profit is the goal on everything that no marketer should forget.